Description:The Anchor Works stood at the junction of Anchor Road, Sutherland Road and Market Street. The Anchor works mustn't be confused with the nearby "British Anchor Pottery" on Anchor Road. These works date from around the 1820s. They had a series of operators including the Carey brothers, John Ashwell, the Copestake Brothers and Fell & Robinson. Latterly it was known as the Pelican Pottery until the 1960s when it was abandoned and was used as a warehouse by the nearby British Anchor Potter. Most of the buildings date from the early 1800s, particularly the two storey range with the four bottle-ovens projecting through the roof, seen on the left of Sutherland Road. 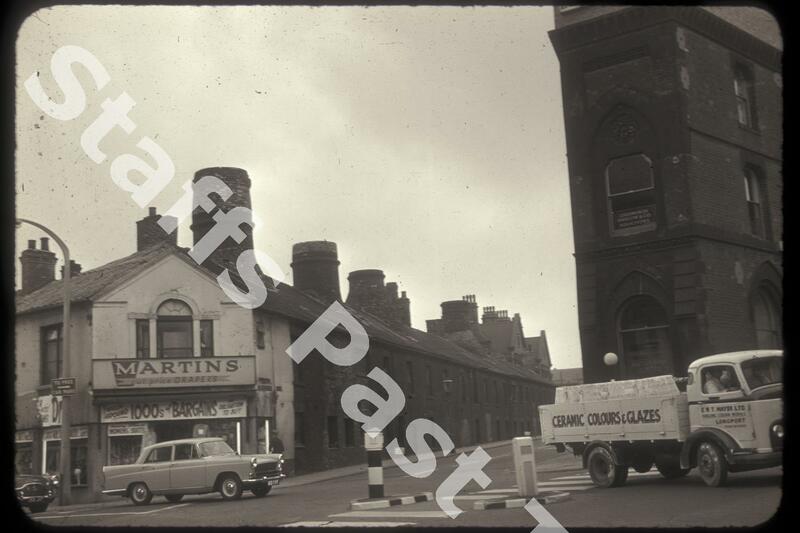 The original entrance to the works has been converted into a shop: Martins cut price drapers. Beyond the works, the building with the two gables is the old Longton Police Station. On the right, the building on the corner is the old Lloyds Bank, with a solicitors office above. This building has been demolished and rebuilt as modern offices. The Anchor Works has also been demolished. 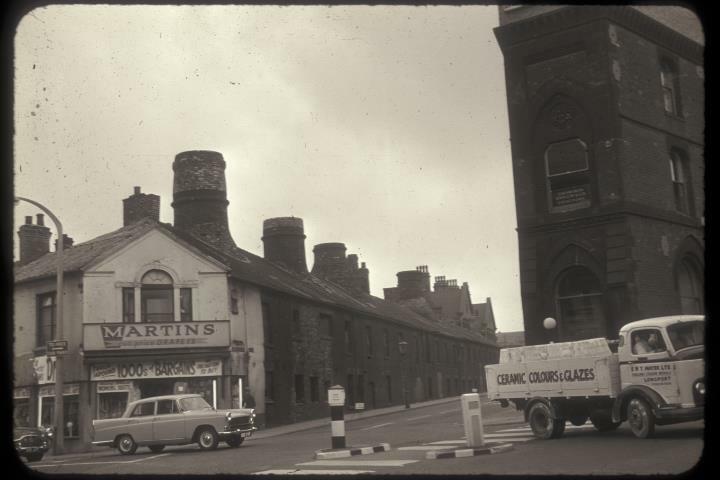 The lorry passing the bank belongs to E Mayer Ltd of the Furlong Colour Works in Longport, suppliers of colours and glazes to the ceramics industry. It is being followed across the junction by a 1960s Austin Cambridge saloon car.